The term “man cave” first entered our vernacular in 1992, when Toronto columnist Joanne Lovering jokingly suggested an alternative name for the basement, as reported in a humorous historical look at the man cave in the LA Times last year. But what is a man cave, exactly? And why does every couple need one? Wikipedia defines a man cave — also known as a manland, mantuary or a manspace — as a male sanctuary or room inside or outside of the home that provides men with a place to de-stress, indulge in their hobbies or generally “do as they please” without upsetting the “female sensibilities” of a home. Some guys go all-out when it comes to creating the ultimate retreat from color coordinated bedding, pink bath salts and vases of fresh flowers infiltrating your shared home. From “offices” that could double as an Irish pub to state of the art media rooms, the possibilities for his dudes-only enclave are endless. It is there that he can freely shoot darts next to a life-sized Homer Simpson figure while wearing his old college football helmet. Or he can watch an entire season of The West Wing in a recliner held together by duct tape. Or he can invite his music-loving buddies over for jam sessions (just hope that the walls are sound proofed). Both men and women benefit from a man cave — As the LA Times explains in their article, male and female brains are wired to treat stress differently. While women may lower stress by talking out their problems, many men need to take time to themselves to cope. When men have the personal space in a man cave to de-stress, women then have the rest of the home to do as they please. Man caves have also allowed couples to work more efficiently and spend more quality time together as a family. Here at Modern-Shed, we fully believe in having the personal space to nurture creativity and decompress from our hectic lives. Our man caves give both men and women the opportunity to have a hideaway chamber, that they can deck out with creature comforts, such as a big-screen TV, a plush couch or a mini-refrigerator. 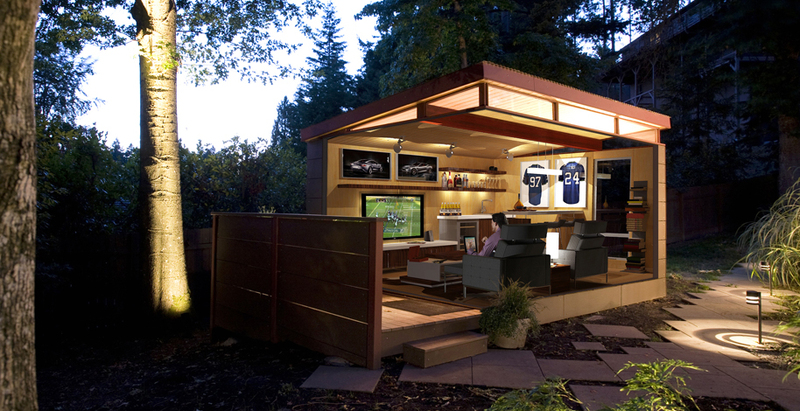 Our clients love lounging about their Modern-Shed man caves, whether it’s to watch this week’s big game or cuddle up with a loved one to steal a private moment away from the kids. Having the personal space to relax after a busy day at work is invaluable, and building a Modern-Shed Man Cave is a less costly option than adding on to a home.